Books | Damaged Disciples: Casualties of Authoritarian Churches and the Shepherding Movement | Watchman Fellowship, Inc. Contents: 176 pages, and notes. 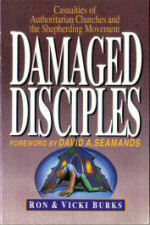 Damaged Disciples is the account of Ron and Vicki Burks' search for a meaningful faith. Unfortunately, the nontraditional church they found trapped them in a branch of the charismatic movement that taught them to be subject to their spiritual "masters" in every area of life. Vicki was taught to submit herself to her husband where she was to be sustained by his spiritual life which, in essence, allowed none for her. This is also the chronicle of the beginning of their journey back to faith and wholeness.